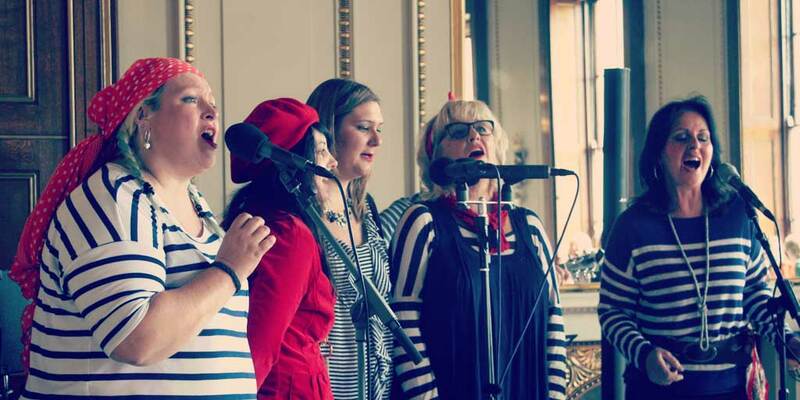 The Fishwives Choir recently performed their brand new repertoire at Fishmongers’ Hall. Rachel Smith was there to hear it and to talk about their upcoming album. It sounds like an old folklore scene. But it was only six years ago that Jane Dolby was waiting for her husband, Colin, to come home. He was a sixth-generation fisherman in Leigh-on-Sea: an experienced trawlerman who had worked at sea his whole life. But earlier that day though, a storm blew up from nowhere and sunk his boat. Colin never came home. Jane’s initial idea was a kind of karaoke sing-along, but it soon morphed into a choir made up from local fishwives. As soon as the plan reached social networking sites, women from fishing villages all over Britain were keen to get involved. The choir grew to 40 and before Dolby knew what was happening, their single – a mix of When the Boat Comes In and Eternal Father – was running against One Direction for the coveted Christmas number one spot. The cost and logistics of mobilising so many mothers – many single and/or working and all busy – from all corners of the country meant that the choir has had to slim back to the founding members. But The Fishwives’ Choir shows no sign of slowing down. They have a busy tour schedule ahead of them and plans to record a seven-track album at the end of the month. They also harbour dreams to do more educational work, helping to revive the great tradition of sea shanties and encouraging community singing nationwide. Their new repertoire consists of more traditional shanties: Rio Grande, Drunken Sailor, Ocean Bound and Jessie, a song about the Selkie – seals that become human. “Selkie females are said to make dutiful wives, so legend has it that fishermen stole them for their brides, then hid their seal skins to stop them going back in the water,” says Jane. She describes how the chorus references an albatross – a bird associated with sea tragedies – and the relevance of crying seven tears: legend has it that if a Selkie cried seven tears into the ocean, she would be rescued. The songs are laden with tradition. So it seems somehow appropriate that the debut of the new shanties is in a venue so rich in history. In the Court Drawing room, the sun catches the gold cornice, a squeezed melodeon blasts out the first notes and the Ladyfish sway to the Fishwives’ haunting shanties.